Human eyes are not reliable tools for assessing color. Scopes, on the other hand, give you accurate information every time. Scopes are easily among the most important tools for anyone working with images or video. Because human eyes are unreliable for accurately assessing color (because the brain adjusts the visual feed based on surroundings — not to mention that no two screens are exactly the same), scopes provide accurate information about color and exposure levels, so you can ensure that your footage looks great on any screen. In this article, we’ll take a look at the four major scopes, including how they work and when to use each one. 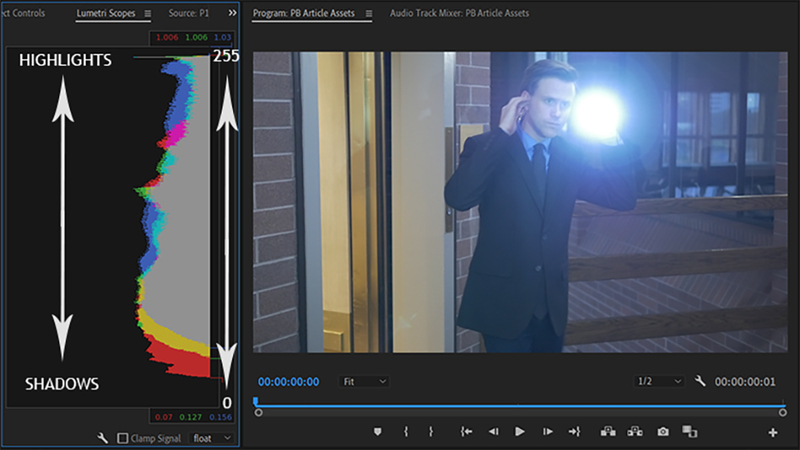 First, for our exploration of scopes, we’ll be using Premiere Pro’s built-in Lumetri Scopes. Scopes vary slightly across applications, but the foundations of each will always be the same. While scopes look intimidating, it’s helpful to remember that they are just complicated, specialized graphs. The four main scopes are simply bar or pie graphs that plot data points in various ways, depending on the intended use of the scope. One quick note: if your computer is beefy enough, always make sure to turn off “Clamp Signal,” and set the color space to “Float.” These two settings will ensure that all of the information in your shot gets represented accurately in your scopes. The most commonly used scope is the histogram. Any modern prosumer or professional video camera, DSLR, or external recording device likely has a built-in histogram. The histogram’s prevalence makes the ability to read one an essential skill. 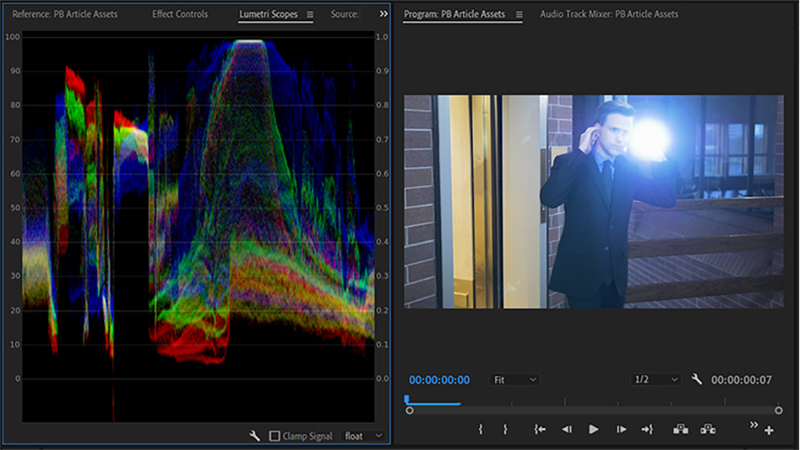 In Premiere, the Histogram is rotated 90 degrees from its usual orientation. This helps you more clearly visualize the information — the top of the scope represents the highlights in your image, and the bottom represents your shadows. Every histogram breaks down into 256 sections, representing each Luminance (Y) value in Rec.709. The histogram analyzes the frame and evaluates the total number of pixels reporting that Y value, and it plots each pixel at the proper point on the scope. Color overlays on the histogram aren’t especially useful because you’re only seeing a representation of how bright your colors are. Sure, that can be helpful information, but we’ll get to the best tool for color measurement shortly. For now, let’s look at another scope for exposure. The Waveform Monitor is, in many cases, a direct upgrade to the histogram. While it displays similar information, the Waveform graph provides additional information that makes bringing your shot into proper exposure much simpler. The Waveform Monitor takes each single-pixel horizontal slice of your frame (so 1,920 for HD) and plots each vertical pixel according to its gray level (or luminance value). As a result, the waveform offers significantly more control and versatility over the histogram because you can visually locate bright and dark areas in your shot. Proper exposure on the waveform should show a large spread between the pixels in your frame, while improper exposure will lead to clustering of the dots. Any information that falls above or below the graph ends up clipped and could result in your video being rejected. 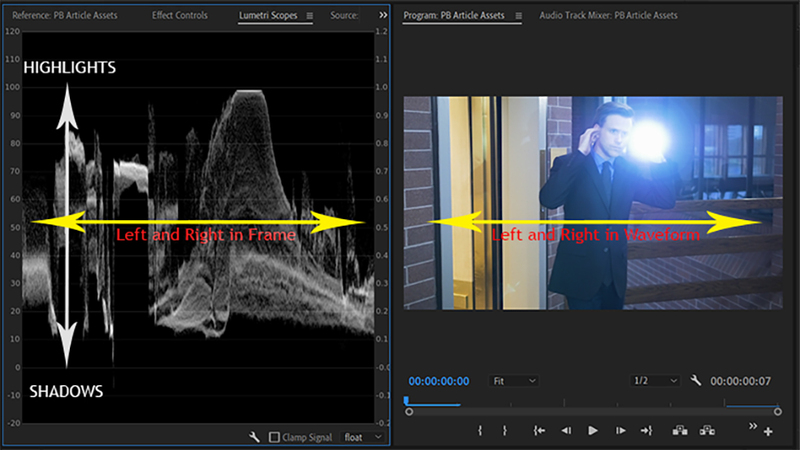 Most waveform monitors also have color overlays that you can enable, but again, there is a better tool for the job. 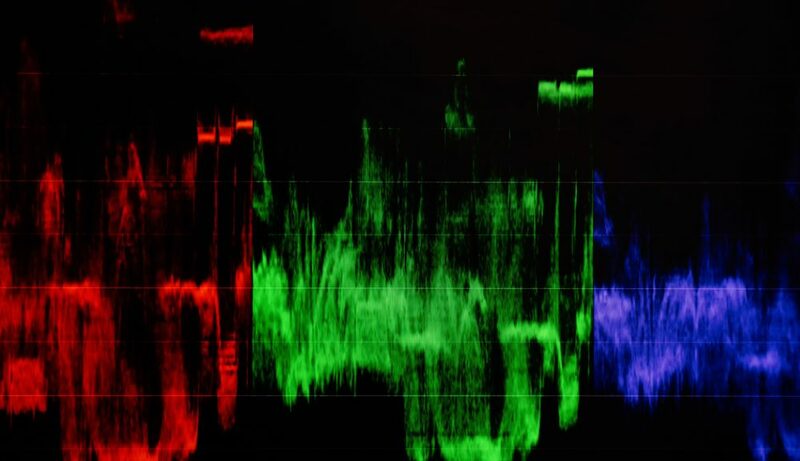 One way the RGB waveform can be extremely useful, however, is when you’re getting unwanted color tinges in any part of your image. When you enable the RGB and Luma overlays, you can see where the undesired color tint is. Simply bring the color down, or the others up — when your colors are in balance, the dots will turn white in the scope.